We now have recordings of two of our past “Out in Science” panel discussions where we welcomed LGBTQ+ people in STEM careers to discuss their professional and personal experiences. For privacy reasons, the 2018 video is accessible only by password, which we are distributing upon email request to prism@rockefeller.edu. The 2017 video is available without password. We are thrilled to announce that The Rockefeller University has opened its first gender-neutral restroom, just outside of the Faculty Club! It may not occur to the well-meaning cisgender person that the women’s or men’s room sign can actually serve as a barrier to entry for transgender, non-binary, and gender-non-conforming (TGNC) people. Have you ever needed to pee and done six or seven passes by the gendered bathroom door and were dying to go in but were too afraid that you may get verbally harassed—or worse? Instead, you think, “that’s okay—I can hold it for the next seven hours until I get home from work.” For many TGNC people, this scenario is routine life. This survey was done before passage of North Carolina’s HB2 bill that specifically targeted TGNC people, preventing them from using the bathroom that corresponds to their gender identity. This bill was passed on March 23, 2016, and repealed March 30, 2017. For many, especially cisgender folks, North Carolina put the struggle for transgender rights in national the forefront, as the bathroom bill garnered significant media attention. Now, speaking from personal experience and having been verbally harassed and barred access to bathrooms (though never at Rockefeller! ), I would not be surprised if a new survey would show that the percentage of TGNC people who have been harassed using bathrooms would be significantly higher since the advent of the HB2 law. Even though the law was repealed, lasting damage is there. For those of us who are fortunate enough to live in New York City, an anti-discrimination law was passed in the early 2000s that bars employers from disallowing TGNC people from using facilities that match their gender identity. This year, the GENDA law was passed and extended that protection to all TGNC people in New York State. Despite protections, harassment often goes undeclared. In our current political climate, we need action. The Rockefeller University has exhibited true support the TGNC population by creating a necessary gender-neutral bathroom facility, which benefits the TGNC population at Rockefeller as well as transgender visitors, including the many speakers and guests PRISM has hosted at our events. This action sets a standard for universities and other employers. Rockefeller University issued a climate survey in November 2018 to gather data to combat sexual misconduct better. The PRISM board met with Rockefeller officials to ensure that that LGBTQ+ demographics were recorded. Previous studies have shown that LGBTQ+ people experience higher rates of sexual misconduct, suggesting that special attention may be needed to protect this class. Language was added to the survey that allowed people to identify as straight, lesbian, gay, bisexual, queer, transgender, nonbinary, or as other sexual and gender minorities. At oSTEM’s 8th Annual Conference in Houston, Texas, PRISM co-founder Aaron Mertz was awarded the oSTEM Global STEM Service Award for his advocacy work for LGBTQ+ scientists. This award is presented to an active member, alumnus/a, chapter mentor, or organization leader of oSTEM who has demonstrated a strong dedication to oSTEM, LGBTQ people in STEM, and STEM education. They are an outstanding role model for the future of our community. They are accomplished in their academic or professional lives and they regularly advocate for the full inclusion of people of all marginalized identities. They are committed to and continually strive to understand the most effective methods for reaching equality for all people. You can view his acceptance speech here. Congratulations, Aaron! 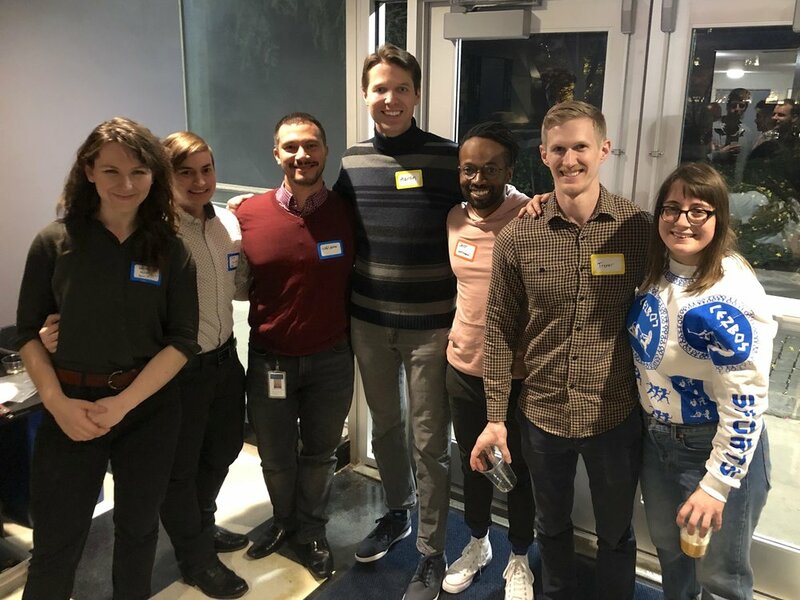 We hosted a social in November for new members of the Rockefeller University community to meet existing PRISM members, and the board discussed plans for the coming year. More than 50 people attended. Our next social will be held in April, with an invitation to follow. This study finds that college students identifying as LGBTQ were 7% less likely than control students to remain in STEM majors after 4 years (n=4162). This study of six STEM related federal agencies (including the NSF) finds that LGBTQ-identified workers report across-the-board lower levels of workplace satisfaction and perceived treatment (n=37,219). This study of LGBT faculty members across disciplines (n=279) found that many experienced exclusionary behavior and harassment, and a majority of LGBT STEM faculty surveyed considered leaving their institution as a result. This survey of LGBTQ workers in STEM found that many work in environments they see as hostile to their identity, and most could not recall a single openly LGBTQ faculty member during their training (n=1427). This report summarizes a few surveys of the climate for LGBTQ physicists. It finds that their experiences are highly variable across different locations, and that transgender or gender-nonconforming physicists experienced higher levels of isolation and harassment. Individuals who are from sexual and gender minority (SGM) groups have not been identified as underrepresented populations by the NSF. The revised Notice of Interest in Diversity does not address SGM groups. It is certainly an issue of which NIH is mindful. I agree wholeheartedly about the need to collect sexual orientation data for NIH researchers because without those data it is impossible to highlight LGBTQ as an underrepresented group. Our office has begun discussions with the Sexual & Gender Minority Research Office at NIH . As you may be aware, NIH does not currently have the authority to collect sexual orientation and gender identity questions for applicants at this time. OMB has convened the Federal Interagency Working Group on Measuring Sexual Orientation and Gender Identity (SOGI) to begin addressing concerns regarding the availability of data for sexual and gender minority (SGM) populations and the methodological issues in collecting such data. The All of Us program is asking about sexual orientation but that is of study participants. The EPA and NIH have some pilot programs inquiring about employee sexual orientation to get at some of the SGM populations within federal workforce issue. As far as I’m aware, federal standards have not been developed regarding the collection of data regarding SGM populations. I am hoping there is movement on this soon. The working group cited (SOGI) completed their work in 2016, suggesting there is still no movement on even starting to collect the data that the NIH deems necessary to determine whether the LGBTQ community (or subsets within the community) are underrepresented in the NIH workforce. We feel that the NIH should not ignore peer-reviewed publications documenting discrimination against LGBTQ workers in the meantime. The interest in diversity statement is also lacking in its treatment of intersectional minority groups, i.e. those who fall into two or more underrepresented groups. The statement mentions that women who have another minority status face additional challenges, but ignores other types of intersectionality. We feel the NIH is well behind current areas of diversity research and should work quickly to improve data collection and implementation of initiatives. Panelists Dr. Karissa Sanbonmatsu, Dr. Manu Platt, Dr. Ann Kwong, with moderator Dr. William Cafferty, and panelists Dr. Elena Long and Dr. Zhirong Bao. 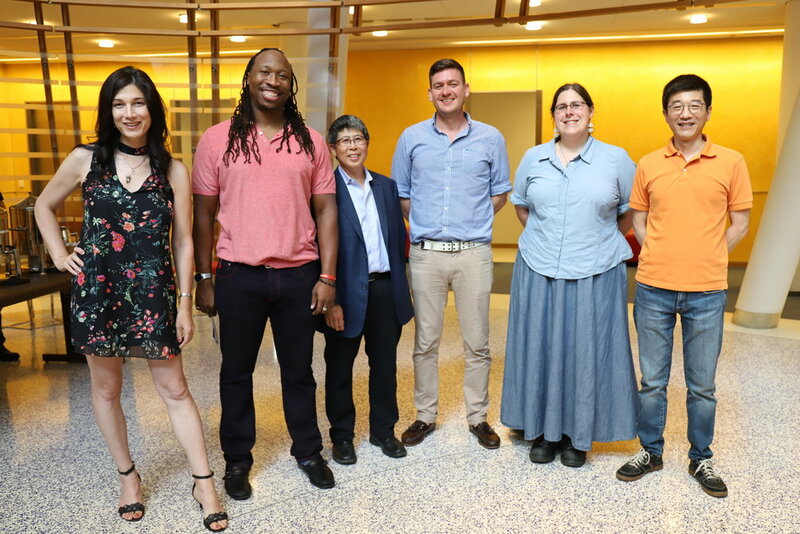 PRISM’s third annual Out in Science panel discussion brought together six accomplished scientists from the LGBTQ+ community with junior scientists from the New York area. The panelists discussed their career experiences, offering perspective and advice on how to build a successful career and make science a better place for LGBTQ+ people. The panel was comprised of scientists in academic positions, industry, and affiliated with national labs. The panelists also represented several ethnicities and different countries of origin, and identified as trans, gay, and lesbian. This gave an unusually diverse and informative array of perspectives and demonstrated that there were multiple ways to be successful in science and multiple ways to approach one’s LGBTQ+ identity. Several panelists explained that ethnicity or gender is always the first part of their identity that people are aware of, and as such, they spend more of their time navigating the biases that others hold about these aspects of their identity than about their LGBTQ+ identity. This was observation was referenced by the people of color on the panel, Manu Platt, PhD, Associate Professor of Biomedical Engineering at Georgia Institute of Technology, Ann Kwong, PhD, Founder and CEO of Trek Therapeutics, and Zhirong Bao, Professor at Memorial Sloan Kettering Cancer Center. For some panelists, the topic of sexual orientation rarely comes up in their professional lives, whereas other panelists spent a significant amount of time evaluating whether it was ok to come out to colleagues. This illustrates the additional cognitive tax that minorities must pay to evaluate how to navigate everyday situations, and how this differs between people. Two trans panelists told of the significant discrimination toward this group, but also gave advice on how to improve the work environment. Both Karissa Sanbonmatsu, PhD, a Principal Investigator at Los Alamos National labs and Elena Long, PhD, Assistant Professor of Physics at the University of New Hampshire have led initiatives to train their colleagues about how to support LGBTQ+ scientists and especially avoid worst-case scenarios that could cause mental harm to these people. Professor Long has coauthored a guide for university departments (that can be found at https://lgbtphysicists.org) with specific recommendations for departments, hiring committees, classroom teachers, mentors, and administrators. The panelists described the climate for trans people as similar to the experience of gay and lesbian people in 80s when outright hostility and discrimination was common. Even within academic environments, which are often thought of as progressive, the majority of people remain uneducated and often unwelcoming to trans people. Institutional hurdles to transitioning and unprepared advisors and administrators can levy unnecessary difficulties. The panelists advised young trans scientists to reach out to others for advice and assured them that there were people who had dealt with similar challenges. Some questions asked by the audience or moderator William Cafferty, PhD, Associate Professor of Neurology at Yale University elicited very different responses from the panelists. One such question was about when to come out in the workplace. Dr. Kwong advised bringing it up after a job offer has been made, a time when the scientist has the greatest power during the interview process. Other panelists described including LGBTQ+ activities on their resume or CV, ensuring that the hiring committee is aware throughout the entire process. Two panelists said they do not bring it up in a professional context, but only with colleagues they are close two. Another controversial topic was the idea of whether LGBTQ+ people should feel an obligation to be out and active in promoting LGBTQ+ scientists. Some panelists felt an obligation to do so while others emphasized that it is a personal decision and no one should feel obligated. The panelists’ responses underscore the idea that coming out is a personal decision that everyone makes for themselves. Audience members expressed gratitude to the panelists for their thoughtful responses to questions and openness to be role models for the next generation of scientists. Many of the panelists did not have LGBTQ+ scientist role models as they were starting their career. The PRISM board thanks the panelists, moderator, and audience members for an excellent panel discussion. Watch for information next summer about the 4th annual Out In Science panel at Rockefeller University. To watch a video recording of the panel, please request the password by emailing prism@rockefeller.edu. The charitable trust “Pride in STEM” declared today, July 5, LGBTSTEM Day. You can read more about the day here, as well as a poignant comment that appeared this week in Nature about LGBTQ+ scientists. The PRISM Board organized a multi-institutional group to march in New York City Pride on June 24 under the banner of the national organization Out in Science, Technology, Engineering, and Mathematics (oSTEM). We hosted approximately 60 LGBTQ+ and allied scientists from 17 institutions—academic, industrial, nonprofit, educational—who marched in Manhattan south on 7th Avenue through Greenwich Village and then north on 5th Avenue, join ~450 other LGBTQ+ organizations, major corporations, politicians, and media figures. Our contingent was one of a very few STEM-related groups in the march. We marched to celebrate the openness we enjoy that was won by older generations, but also to protest the continued lack of equal treatment of LGBTQ+ scientists. Although studies have demonstrated that LGBTQ+ individuals leave STEM majors at a greater rate, and that LGBTQ+ scientists report discrimination in the workplace, they are not recognized as an underrepresented group by any major funding agency—a designation that could mitigate some of these disadvantages. Transgender scientists in particular face especially high levels of discrimination and encounter major institutional bureaucratic hurdles while transitioning and even years later. Our group was comprised of people from different ethnic and socioeconomic backgrounds, many countries of origin, and a broad spectrum of LGBTQ+ identities, underscoring the diversity we envision for the future of the scientific workforce. We hope that, by marching, we have inspired others to live authentic, open lives as scientists and to realize they are not alone. We also hoped to raise awareness to the march’s spectators that LGBTQ+ people are an important part of the scientific workforce. Throughout the march, we heard onlookers exclaim, “Wow, scientists!” underscoring how infrequently the public seems to interact with STEM professionals. June is the month of Gay Pride in New York and many other states that celebrate gay pride. Historically June is the month of Gay Pride because it commemorates the 1969 Stonewall Riots, that began in the early morning of June 28, 1969. Gay Pride has evolved in several ways over the decades, starting as Gay Day on the last day of June, close to the day the riots started, and culminating today as an entire month to celebrate the LGBTQ+ community and continue the fight for equality. In this post, I would like to highlight one of the most pivotal an influential people that fought for our rights in the Stonewall Riots, Marsha P. Johnson, a transgender woman of color. 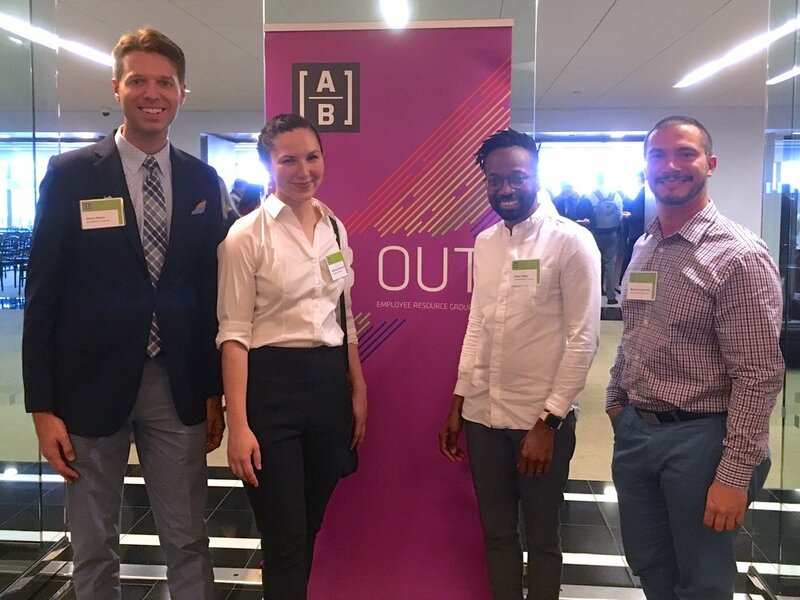 Employees of the financial services firm AllianceBernstein invited the PRISM Board to its Pride event entitled “Is is really getting better?” on June 21 in Midtown Manhattan. "It costs a lot of money to look this cheap." "I'm not offended by all the dumb blonde jokes because I know I'm not dumb... and I also know that I'm not blonde." "The way I see it, if you want the rainbow, you gotta put up with the rain." "We cannot direct the wind, but we can adjust the sails." Then, the company debuted its latest video about being openly LGBTQ+ at the firm, as an update to the video they produced five years ago. 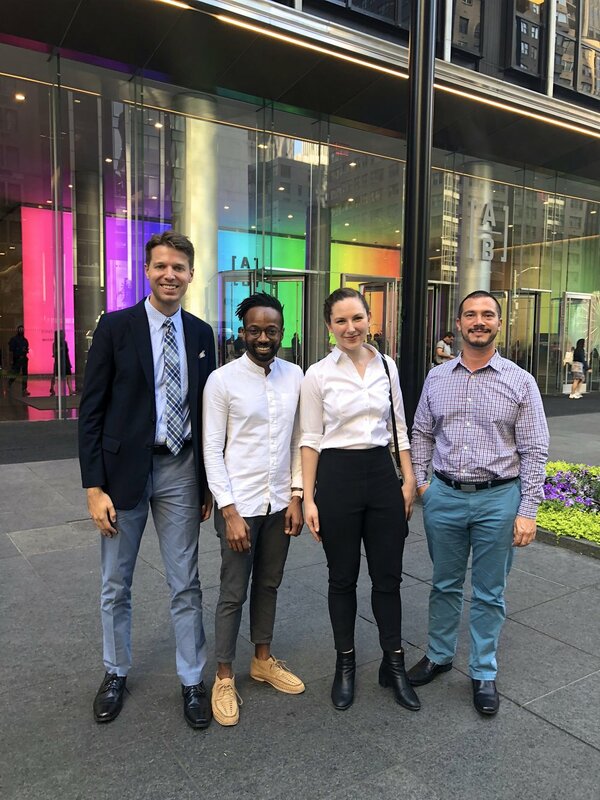 Next, four LGBTQ+ AllianceBernstein employees shared, in a panel discussion, their experiences coming out to their families and at work in the financial sector, which has a reputation for being conservative relative to other industries. The event concluded with a reception with sweeping views of Central Park from AllianceBernstein’s 41st-story office space. In late 2015, five trainees at Rockefeller created People at Rockefeller Identifying as Sexual/Gender Minorities (PRISM), to address a perceived lack of community for LGBTQ+ people at Rockefeller University. Along with that lack of community came a lack of data, so PRISM’s first action was to survey our constituency in 2016. On June 1, 2018 Rockefeller PRISM hosted a joint happy hour with a newly formed Mount Sinai LGBTQ organization. The event included approximately 25 people from the two institutions and lasted for about 4 hours. One participant later wrote on social media, "For the first time in a while, my friendly inquiries about the life stories of strangers were welcomed with colorful elaborations rather than viewed with suspicion followed by a minimal answer." 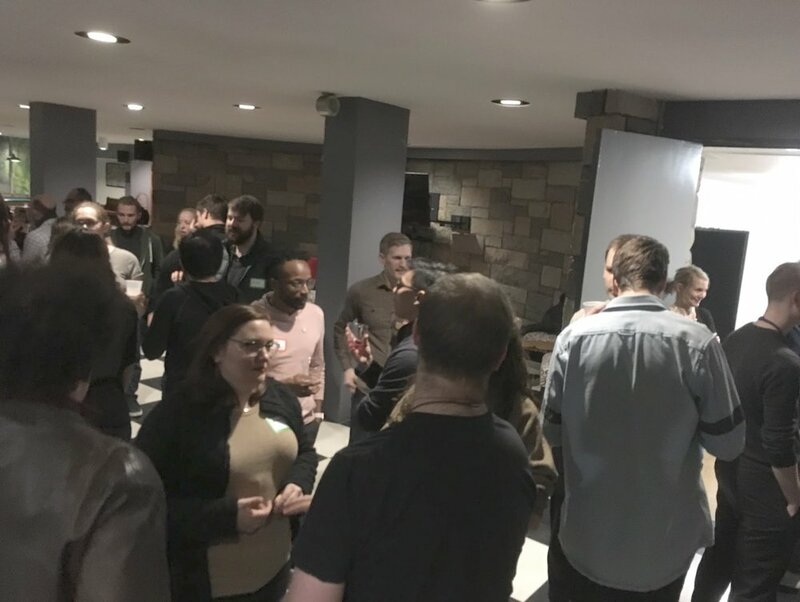 We look forward to hosting more events to facilitate meaningful connections among the LGBTQ science community. On April 19, some of the PRISM board members had lunch with Paul Beirne, a friend of PRISM. Mr. Beirne is a National Managing Director with AllianceBernstein, a global investment management firm based in New York that manages over $500 billion for individuals, families, pension plans, unions, foundations, public funds, and other entities. Mr. Beirne has been involved in various developments in the Rockefeller campus. During lunch we discussed similarities and differences between science and finance for LGBTQ+ people. We also talked about the importance of having a work organization representing the LGBTQ+ interests in order to make the work environment a safer and more reliable place to grow professionally and personally. He also talked about his experience and the importance of having role models that would share the vision and values of the profession. He shared with us AllianceBernstein's video produced for Pride a few years ago. (L to R) Paul Beirne (AllianceBernstein) and PRISM board members Mariano Cardenas, Aylesse Sordillo, Molly Liu, Gabriella Spitz-Becker, and Aaron Mertz in the Abby Aldrich Rockefeller Lounge. We are very happy to share that a lot of people attended the PRISM and WISeR breakfast with Dr. Clare Waterman, NIH Distinguished Investigator on Friday, April 6, at 9am. First of all, we would like to congratulate Dr. Waterman for have recently gotten married and for sharing that exciting news with us! On the one hand, we discussed about her experience as a successful scientist and mentor, as well as how she motivates and trains the future scientists in her lab. On the other hand, we asked her about her coming out as a lesbian and her experience in science. Dr. Waterman replied “I came out when I was 13 years old and I never had any issues with that. Being gay has never been part of my job. I am a good scientist. That’s all”. She shared that she never felt any discrimination in her work environment and emphasized that her successful career allowed her to ask her employers for health insurance for her partner among other benefits. Dr. Waterman shared that she was involved in many demonstrations to claim the legalization of marriage equality in California. Thanks, Dr. Waterman, for all the things you have done for our community! Dr. Waterman is a NIH Distinguished Investigator and has received numerous awards and honors for her work, including the Arthur S. Flemming Award for Public Service (Basic Science) from George Washington University. Dr. Waterman has made fundamental advances in the understanding of cytoskeletal interactions and has authored or coauthored more than 90 papers. As many of you already know, neuroscientist Dr. Ben Barres, passed away this past December. He was an amazing scientist who discovered crucial roles for glia. He was also a dedicated mentor and fierce advocate for LGBTQ+ individuals in science. We would share this write-up of Dr. Barres that was featured in The Atlantic last month. Last August, The Chronicle of Higher Education ran an article about PRISM and its efforts at Rockefeller. We got our hands on a copy that we can share with you. Check it out! On June 3, PRISM hosted Dr. Carolyn Bertozzi of Stanford University for a roundtable breakfast discussion. She is an out lesbian scientist who researches how cell–surface interactions contribute to human health and disease, with regard to cancer, inflammation, and bacterial infection. In 2007, she was awarded the GLBT Scientist of the Year Award from the National Organization of Gay and Lesbian Scientists and Technical Professionals. People at Rockefeller Identifying as Sexual Minorities (PRISM) formed in late 2015 because we five founders saw a lack of formal LGBTQ+ community at Rockefeller University. Since we are the first group at Rockefeller focusing on LGBTQ+ issues, we had no data about what our community here looked like. So, as good scientists, we set out to get some! Over two weeks in January, we invited all Rockefeller community members by email to fill out a 5-minute survey about LGBTQ+ experiences. LGBTQ+ people feel mostly safe at Rockefeller, but many remain guarded about their identities: More LGBTQ+ people than not say that science is a friendly place for them. However, many respondents are wary of disclosing their identities, especially around senior colleagues. Most respondents have not personally experienced bias or harassment, but those who have are disproportionately LGBTQ+, women, and especially both. LGBTQ+ people have needs that PRISM can fill: a visible community, access to senior role models, and a community across NY institutions. Next: data illustrating these findings.